The rights to any audio/visual content attached or accessed by link within this email are provided strictly on the terms and conditions described under the “License Terms” below. The World Surf League (WSL) is excited to announce that the WSL Surf Ranch Facility in Lemoore, Central California will host the world’s best surfers as part of the 2018 Championship Tour (CT) calendar. Since coming online in December 2015, the WSL Surf Ranch Facility in Lemoore, California has undergone constant refinement and evolution of its technology. A test event this year in September delivered very positive results in terms of competitive experience and the overwhelmingly supportive feedback from surfers training there throughout the season has encouraged the WSL to pursue an event at the facility in 2018. The 2017 WSL Men’s and Women’s Title Races are coming down to the final events of the season – the Billabong Pipe Masters in memory of Andy Irons in Hawaii, USA from December 8 – 20, 2017 and the Maui Women’s Pro at Honolua Bay from November 25 – December 6, 2017. The rights to the images attached or accessed by link within this email are granted by the Association of Surfing Professionals LLC (“World Surf League”) for editorial use only. No commercial rights are granted to the Images in any way. The Images are provided on an “as is” basis and no warranty is provided for use of a particular purpose. Rights to individuals within the Images are not provided. The copyright is owned by World Surf League. Sale or license of the Images is prohibited. ALL RIGHTS RESERVED. The rights to the audio/visual content attached or accessed by link within this email (“Footage”) are granted by the Association of Surfing Professionals LLC (“World Surf League”) to you (the email recipient) and any entity you forward the same to pursuant to the terms and conditions below (“Footage License”): By opening or accessing the Footage, you accept the terms of this Footage License. The rights to the Footage (or any part of it) are royalty-free and granted for editorial use or news service use only and this Footage License will expire one (1) week from the date the event subject to this Footage License concludes. No rights for commercial use or modification of the Footage are granted in any way, including any association made with a commercial brand or message. Where the Footage is used in any way online, a link to www.worldsurfleague.com must exist where the Footage is visible. The Footage is provided, and must be used on an “as is” basis and no warranty is provided for it’s use by you. Rights to individuals or brands (except WSL) within the Footage are not granted. World Surf League owns all rights, including copyright to the Footage. ALL RIGHTS NOT SPECIFICALLY PROVIDED ABOVE ARE RESERVED BY WORLD SURF LEAGUE. New Pier, Durban, Wednesday 15 November 2017 – Event organisers for the Cell C Goodwave surfing event have issued an amber alert for the event to run this upcoming weekend. It is a standby call and a heads up for all invited surfers. Organisers will make the final call tomorrow morning (Thurs 16 November) for a possible start for the event on Friday morning. Cell C Goodwave official forecaster Spike from www.wavescape.co.za has been monitoring the conditions. “A cutoff low pressure cell detaches from the coast overnight Wednesday and forms into a strong system South East of Durban by Thursday morning,” says Spike. “A two day groundswell arrives on Friday with good energy, lasting into Saturday morning when it’s starting to wane. According to the event organisers there is also an option to possibly run the event split over two days, being Friday and Saturday. The Cell C Goodwave is a unique competition on the South African surfing calendar in that it has a one-year waiting period, it costs only R1 to enter, and first prize is R100k, the largest domestic prize in the country. The Cell C Goodwave has invited 32 surfers to compete in the tournament. Should some of these surfers not make it to the New Pier in Durban on the day, their slots will be filled up with the alternate surfers. Should there still be open slots, the contest director will choose walk-up entries on the day. It is imperative to have a full day of good waves (or two half days) at the New Pier to run the event to completion. The competition will be hosted by California Dreaming restaurant on the beachfront. Oakley and Sun International are both supporting sponsors. In addition, Cell C is also offering free Wi-Fi on the beach during the entire contest. 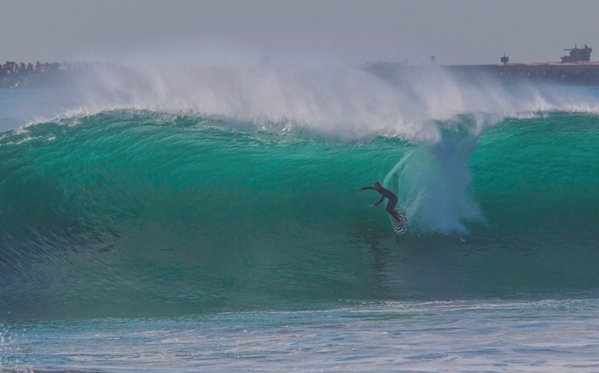 Miss a 10-point ride, and watch the heat replays via the WSL app over the free Wi-Fi. Brandon Jackson, Matt McGillivray, Dale Staples, Shane Sykes, Mikey February, Josh Redman, Damien Fahrenfort, Dan Redman, Mike Frew, Simon Nicholson, Gavin Roberts, Frankie Oberholzer, Matt Bromley, Davey Weare, Grant Baker, Chris Leppan, Sean Holmes, Ricky Basnett, Jason Ribbink, Beyrick de Vries, Gary van Wieringen, Dylan Lightfoot, Chad du Toit, Brendan O’Connor, Warwick Wright, Noel Rahme, Shane Thorne, Paul Canning, Richard Kidd, Davey van Zyl, Robbie Schofield, Greg Emslie. Alan Johns, Josh Smit, Jordy Maree, Adin Jeenes, Simon Fish, Joshe Faulkner, Matt Pallet, Stever Sawyer, Dylan Stewart, Lee Bisset, Scott Venter, Billy Payne, Scott Hamilton, Ryan Payne, Sam Christianson, Derek Footit, Ben Dancaster, Bevan Willis, Koby Oberholzer, Antonio Bortoletto, Manfred Adrio, Wes O’Driscoll, Elton Cuthbert, Andrew Lange, Blane Wood, Chris Frolich, Wade Simkiss, Rene Terblanche, Frank Solomon, Mikhael ‘MK’ Vawda, Casey Grant, Andrew Banks. The Cell C Goodwave is a World Surf League (WSL) Specialty rated event and entry is via invitation only. The Cell C Goodwave – in loving memory of Lee Wolins.